art and life: Published in Somerset Studio woohoo !!! 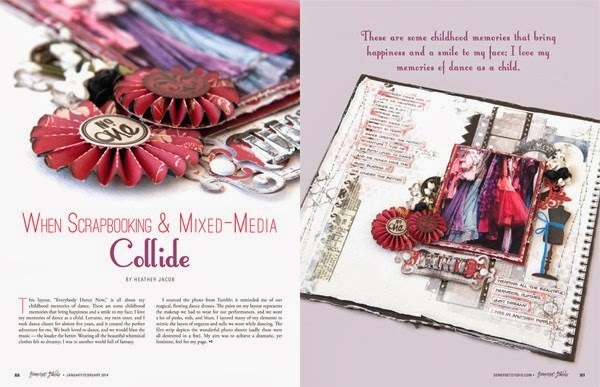 I feel so blessed and lucky to have been published in SOMERSET STUDIO This really has been a DREAM come TRUE for me ... When I received the email from Somerset Studio asking me if they could publish my work I was literally jumping out of my chair doing a happy dance ... so excited to say the least . How do stunningly beautiful, I am delighted with your work!Love them! I am thrilled to see this! Congrats! That is so fantastic! This is stunning and definitely belongs in a magazine! It came together perfectly. This is amazing! I'm so excited for you! Congrats! Love the image and of coarse all the usual added goodness!!! Congratulations on the publication...so totally well deserved! Woohoot, big congrats! That is awesome news, but your lay-out also is definitely publication-worthy! Absolutely gorgeous work! Congrats Heather!! This is such exciting news but not a surprise, your amazing!!!!! Big congrats Heather and so well deserved! I need to get hold of that copy, the LO looks fantastic! And you so deserve to get all the recognition with your amazing work.. Love this layout, typically your design.. But just remember when you are famous all over the world, you are still OUR Heather!!!hehe!! Congrats Heather! It's awesome and the recognition is well deserved! Congratulations! Sometimes dreams come true! This page ist stunning - an original Heather. There is no one who deserves it more!!!!! You are amazing, my idol! Congrats! Congratulations Heather! So well deserved! Your layout is stunning as always! Huge congrats on your publication. This page is utterly gorgeous and the details divine!! This is beautiful. I've been "stuck" on your article for a couple of days and had to blog about it myself.